www.nugget.ca/2016/07/24/beaton-condie-earn-quest-titlesAction’s School of Fitness and Arts fighters Josh Beaton and Justin Condie are taking on tough competition as the co-main events in the 12-bout Quest for the Voyageur Title 5 in Mattawa, Saturday. Condie is the “hometown boy” from Mattawa who has competed in the four previous events and now faces TMAC fighter Todd Elvrum from Timmins in the 175-to-180-pound weight class. North Bay’s Beaton will go against Jeff Brown of Peterborough DOHJO in the 175-pound muay thai division as the main fight. The event will be held at the Mike Rodden Arena and Community Centre, 450 Hurdman St. 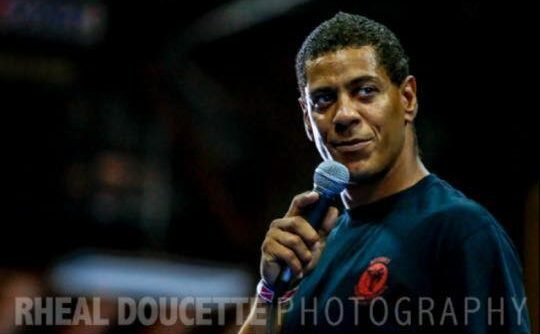 Doors open at 1 p.m. and the first bout starts at 2 p.m.
Other Team Action fighters include Albert Belanger fighting David Melbouf in a kickboxing fight for 225-pounders. Troy Clarke faces Pickering P4P fighter Maurice Pompey in a 135-140-lb muay thai contest. 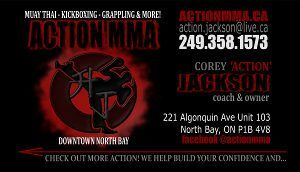 Nick Caruso has a kickboxing bout against Sudbury BJJ and MT fighter Shawn Donaldson in the 140-to-145-lb division. And Leah Hardy faces Rebecca Contrino from the Titans Academy of Quebec as 150-pounders. This is a family-friendly event sanctioned by the World Kickboxing Federation and fully supported by the Town of Mattawa as an event of municipal significance. “Mattawa Voyageur Days is pleased to have this event as part of the total festival package of amazing programs,” says Jacques Begin, co-chairman of Mattawa Voyageur Days. Tickets cost $30 in advance or $35 at the door. Children 10 and younger are admitted free. Authentic Thai food will be sold and tickets for sale at Mattawa Petro (Crevier) in Mattawa, by text at 249-358-0470 or from any of the athletes. For more information, search Quest for the Voyageur Title 5 on Facebook, or call/text 249-358-0470. “MY JOB IS TO DIVE INTO THE STUDENT’S BRAIN AND HELP THEM TO REALIZE THEIR OWN POTENTIAL. © 2019 ACTION MMA. Designed Managed by site28.